Gorillaz are a british virtual band formed in 1998 by a collaboration between Damon Albarn of Blur and Jamie Hewlett, co-creator of the comic book Tank Girl. They had the idea to create the band while watching MTV in their London flat and originally intended to call the project Gorilla. The band is comprised of four fictional band members: 2-D (vocals, keyboard), Murdoc Niccals (bass), Noodle (guitar, vocals), and Russel Hobbs (drums). These characters only appear in animated form and are not alter-egos of real people, as is often mistakenly assumed. There is an extensive fictional back-story behind these band members, written by Albarn and Hewlett. Their albums, several of their music videos, and their autobiographical book Rise Of The Ogre all tell the saga. Damon Albarn is the only permanent musical contributor to the band, which is a collaboration between various musicians. Their style is broad, with a large number of alternative influences including rock, hip-hop, and electronica. They have released three studio albums: Gorillaz (2001), Demon Days (2005), and Plastic Beach (2010). Additionally, they have put out two B-side collections, G-Sides (2001) and D-Sides (2007), and a reggae remix of the Gorillaz album entitled Laika Come Home (2002). The band has also released three DVDs: Phase One: Celebrity Takedown, Demon Days: Live at Manchester Opera House, and Phase Two: Slow Boat To Hades. At the end of 2010, Gorillaz released their next album, The Fall, which was recorded during their US ‘Escape to Plastic Beach’ tour. It is promoted as being the first album made entirely on iPad. The album is streamed on the Gorillaz website. The band’s first single, Clint Eastwood, was released on 5 March 2001. This single was the first of four from Gorillaz, which was released on 26 March 2001. The other three singles were released over the next year. These were: 19-2000, Rock the House, and Tomorrow Comes Today. The album sold over 7 million copies worldwide and has gone platinum twice in the United Kingdom earning them an entry in the Guinness Book of Records as the Most Successful Virtual Band. It was nominated for the Mercury Prize, but the nomination was later withdrawn at the band’s request. Collaborators on the first album included Del tha Funkee Homosapien (often mistaken as a band-member), Miho Hatori (formerly of Cibo Matto), Tina Weymouth of Talking Heads.and Ibrahim Ferrer. The album was produced by Dan The Automator. In late 2007, Albarn and Hewlett began working on Carousel, a new Gorillaz project which eventually evolved into the band’s third studio album, Plastic Beach, which was released 9 March 2010. Albarn said, “I’m making this one the most pop record I’ve ever made in many ways, but with all my experience to try and at least present something that has got depth.” The album features guest performances by Snoop Dogg, Lou Reed, Mos Def, Bobby Womack, Gruff Rhys, Mark E. Smith, Mick Jones, Paul Simonon, Kano, Bashy, De La Soul, Little Dragon, Hypnotic Brass Ensemble, Sinfonia Viva, and The Lebanese National Orchestra for Oriental Arabic Music. Since the band began to achieve mainstream success, there have been rumours of them working on a full-length movie. Some of these have been confirmed, but nothing has gotten beyond planning stages, mainly due to conflicts between the band and studios involved. The duo behind the Pop Opera built on ideas from Monkey: Journey to the West to release a short film in the Summer of 2008 which accompanied the United Kingdom’s coverage of the BBC Olympic Coverage in Beijing. It featured a basic outline of the main plot elements of the Opera, reworked into a “Journey to the East”, with the characters finishing in the Beijing Olympic Stadium. At the end of 2010 Gorillaz released their next album The Fall made in the hotel rooms during their US tour. It is the first album made entirely on iPad. The album is streamed on the Gorillaz website and was available for free download for a limited time.On 5 October 2011, Gorillaz announced their first "greatest hits" compilation, The Singles Collection 2001–2011, which was released on 28 November 2011. On 9th February 2012, Gorillaz confirmed that the single will be called "DoYaThing", and that the two collaborators working on this single will be James Murphy of LCD Soundsystem and Andre 3000 of Outkast. 2D will rap for the first two verses, James Murphy will sing the chorus, and Andre 3000 then overtakes the rest of the track with another rap verse. The track is available for free download in Journeys stores by scanning the QR Code on display items. There will also be an explicit, 13 Minute long version of the single released on a later date. It has also been confirmed that Jamie Hewlett is working on a new Music Video for this single, featuring animated versions of the two collaborators on this track. Murdoc also stated that the music video will feature the Gorillaz' new HQ, for which they have abandoned Plastic Beach. The video premiered on February 29, 2012. 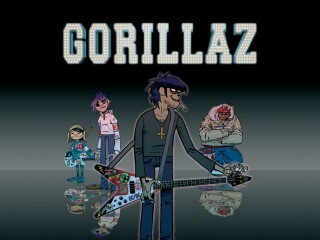 View the full website biography of Gorillaz.